In this guide I will show how to set up a Linux guest OS for Android development. Android Device – If you want to learn how to run your app on a device and not emulator. I’m using a Sony z1. Step 1 – Why is my screen so small?! Android is based on Linux and most tools for developing is made for Linux. I used to develop using Windows but it was never as smooth as for Linux. Sometimes my work has forced me to use a Windows machine and then the first thing I do is to install a linux VM. I really hate to use Cygwin – why try imitate Linux when you can have the real thing? Now using virtualbox for Android isn’t totally pain free since you need to use adb through USB, something that can be tricky to set up correctly, especially if your host is Linux. When I first started to use Ubuntu I loved it. It was not full of things I didn’t need as in Windows and it was quite user friendly. However, after a while I started to feel it was bloated and I never liked Unity. Unity throws big icons in my face and more than a few times it is incompatible and you have to do a lot of research to solve the problems. If you are going to use your VM for Android development I instead recommend Xubuntu. It is very similar to Ubuntu, but it is stripped down and the desktop environment xfce is much more in my taste. In this guide I will be using Xubuntu, but it should be fine to use any Ubuntu clone. In this guide I’m using Xubuntu 14.04 64-bit. First thing to do is to is to update the guest OS. Note that for this guide ‘$’ means normal shell command, while ‘#’ means executed as super user. This is probably everyone’s first question when they have installed a Linux guest. Pressing [right ctrl + f] enter full screen mode, but still the working area is 800×600. You need to install the guest additions to get a higher resolution. The good news is that for Ubuntu it is easy (while it is somewhat more demanding for other distros such as CentOS). Make sure you choose “All Android Packages” and not “SDK tools only”. In this guide I have used android-studio-ide-141.1980579-linux.zip. If you have 64-bit version of your guest, then you will have to install some 32-but libraries to be able to run Android Studio. I found Darcula them doesn’t look good in Xubuntu so I choose the default IntelliJ. The Choose Device dialog is empty. Hmm… there’s no USB device connected. Try to run the same command on your host if you run Linux, or check “This PC” if you use windows. The USB is visible at the host right? To allow the guest to detect USB you need to add it to the VM USB Device Filters. Open virtualbox and click USB and then on the USB with a green plus sign. You should see your device in this list. Select it and make sure it is checked and then press OK.
Only one OS (host or guest) can control an USB device at the same time. This is important to remember when you troubleshot your USB. The Device Filter control if the guest OS should use the USB or the host. 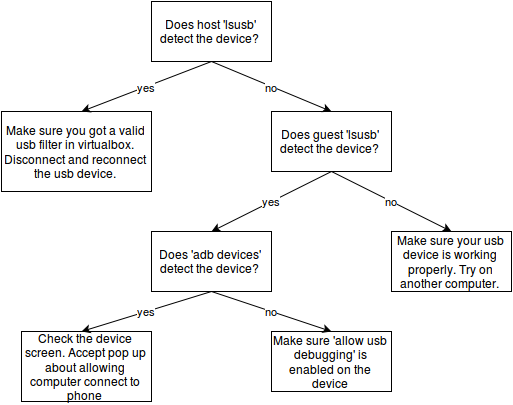 Disconnect the USB and reconnect it and check for devices on your guest. Don’t forget to check the “USB debugging” in developers option of the Android Device. You need to add yourself to vboxusers group, or you wont have permission to access the USB devices. Make sure USB debugging is on on the android device. Setting up an Android development environment on a guest is quite same as on a host. The only thing you need to consider is the USB support. Your key tools when trouble shooting is lsusb and adb. adb devices gives you information about the android device, while lsusb gives you information about USB devices. I prefer Xubuntu, but if you want a really easy installation I recommend Linux mint http://www.linuxmint.com/download.php. It automatically installs the guest drivers (and cinnamon looks damn good). Cooperates should really consider using mint instead of Ubuntu.